Molly Dineen is one of Britain's most acclaimed contemporary documentary filmmakers, known for her intimate and probing portrait films, and the recipient of a great many accolades including BAFTA, Grierson and Royal Television Society awards. Over the coming months, the BFI will bring Dineen's extraordinary films to DVD, making them available for the first time since their broadcast, with the release of three double-disc sets, each containing extensive extra features and booklets. Continuing the BFI's work to celebrate the great documentary tradition in this country, this collection brings together Molly Dineen's portraits of British people and institutions struggling to cope with the effects of change. These films, which address many of the defining issues of the post-war era, from the end of colonialism in the much-loved Home from the Hill (1987), to our relationship with the countryside in The Lie of the Land (2007), provide us with a profound insight into the evolution of Britain over the past 25 years. 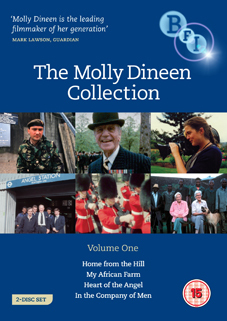 Volume One, released on 25th April, opens with Dineen's award-winning debut Home from the Hill, in which we follow charismatic Colonel Hilary Hook, an elderly retired soldier, as he leaves his Kenyan home and returns to a forbidding Eighties England which is completely foreign to him. The film – picked up by Eddie Mirzoeff, editor of the renowned BBC2 series 40 Minutes – was shown several times; Colonel Hook became a star overnight, and Dineen was heralded as one of Britain's brightest documentary filmmaking talents, her observational style and natural but direct approach becoming her trademark. This volume also features: My African Farm (1988), in which Dineen returns to Kenya and to the home of Sylvia Richardson, building a complex and uncompromising portrait of an unswerving stalwart of British colonialism; Heart of the Angel (1989), a wry, humorous and sometimes touching look at the trials faced by the staff and passengers of London's dishearteningly dilapidated Angel tube station, before its modernisation; In the Company of Men (1995), a three-part series with the Prince of Wales's Company of Welsh Guards led by the engaging Major Crispin Black, now a well-known TV commentator on terrorism and military intelligence. More recently known for their work in Afghanistan, this series follows the men on a final tour of duty in pre-ceasefire Northern Ireland and is a revealing look at army life and the terrors, tension and often boredom of modern soldiering. Volume Two, released on 22nd August, brings us The Ark (1993), the memorable four-part series in which the management, staff and animals of London Zoo fought for survival in the face of drastic cuts and threatened closure. This BAFTA award-winning series was seen by many as a metaphor for what happened in Thatcher's Britain, as public service institutions had to battle for the first time with the harsh reality of market forces. Volume Three, released on 21st November, will contain Geri (1999), the provocative portrait of Geri Halliwell on her departure from the Spice Girls, The Lords' Tale (2002), a privileged insight into the historic event in the House of Lords during the unprecedented move to make hereditary Lords redundant, and The Lie of the Land (2007), another BAFTA Award-winning investigation, this time into the devastating effects of economic change on Britain's countryside, set against the enforcement of the hunting ban. An additional feature will be the Party Political Broadcast, Tony Blair (1997), the 10 minute portrait of Tony Blair so crucial to his landmark election campaign. Illustrated booklet with essays and notes, featuring contributions from Eddie Mirzoeff, former editor of 40 Minutes and Stella Bruzzi, Professor of Film & Television Studies, University of Warwick.